My latest culinary revelation comes with two warnings: Coconut and dried dates are a pairing made in heaven. Warning #1: It's highly addictive. Warning #2: I will surely explore all sorts of recipes containing these two ingredients and post them here. 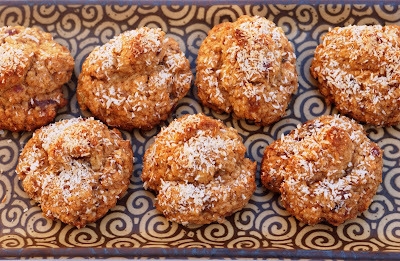 I had this coconut cookie recipe and wanted to replace the refined sugar with dried fruit. I had dried dates at hand. That was all it took. The tangy date flavor works beautifully with the light coconut taste. All other ingredients are natural healthy too, so you can actually eat these cookies for breakfast. Combine pitted dates, coconut oil, egg, vanilla extract and salt in a food processor and blend until smooth. In a separate bowl, combine oats, flour, and baking powder. Add the wet ingredients to the dry mixture and stir until well combined. Use a piping bag to make swirls out of the dough. Alternatively, drop tablespoons of dough onto the baking sheet, leaving a little space between them. 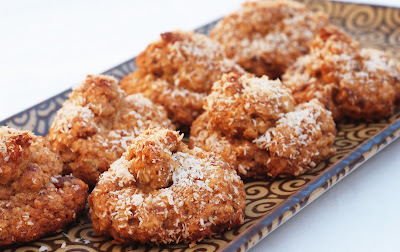 Sprinkle some coconut flakes over the cookies for garnish. Bake for about 10 minutes or until golden brown.